There's something very positive to be said about these old novels; this one was written in 1928 and still has a lot of power to entertain. 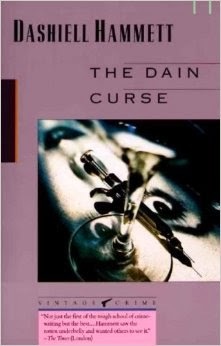 According to one website I visited for background on this book, The Dain Curse first made its appearance in Black Mask magazine as a serial released between October 1928 and January 1929; it was his second Continental Op story after Red Harvest. It may not be Hammett's best, but I still had a lot of fun with it. I mean, seriously -- you have a whacked-out bunch of people involved in a crazy cult, a wealthy drug-addicted, simpering heroine who just might be the victim of a curse, an old house by the sea, a man hiding a secret identity, and of course, a number of murders. Set in San Francisco, Hammett's unnamed detective, known to readers only as "The Continental Op," is tasked by his company to investigate the reported theft of some diamonds. The diamonds were in the possession of Edgar Leggett when they were stolen; Leggett's daughter Gabrielle may have been a witness. From the getgo, the detective believes it was an inside job, and the opening stages of the investigation lead him to the Temple of the Holy Grail, "the fashionable one just now" run by one of Leggett's friends and frequented by Gabrielle. It's a place where "the right sort of people" go, not a "Holy Roller or House of David sort of thing." After a spending a night in the temple that he'll never forget, one that ends in death, the case moves the Op to a small seaside town where he immediately discovers another yet another body, eventually coming to the realization that he's been pitted against a madman. "Are you -- who make your living snooping -- sneering at my curiosity about people and my attempts to satisfy it?" "We're different...I do mine with the object of putting people in jail, and I get paid for it, though not as much as I should." "That's not different...I do mine with the object of putting people in books, and I get paid for it, though not as much as I should." Yet while these scenes scattered here and there throughout the novel are interesting, the focus is really on the crimes and how the Continental Op arrives at the solution -- and it's a ride that is beyond crazy. Another thing to point out is that this book is filled with racist remarks; not that I condone them but they are a product of the times in which this book was written so keep that in mind as you read. Definitely recommended for those who enjoy vintage crime; cozy readers and strictly police-procedural fans probably wouldn't enjoy it as much. 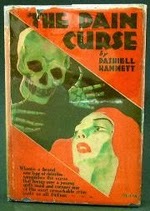 Now I'm going to go back and read Red Harvest ... then make my way through the rest of Hammett's novels that I've missed. Thank you. This was a fun book. I don't think people should write these old books off just because of their age!